Understanding an argumentative piece of writing requires skills that are different from understanding other pieces of writing. Particularly at university it’s important to read argumentative writing more carefully and in more detail than you might otherwise so as not to misunderstand what the writer is trying to persuade you to believe. You can only evaluate and respond to an argument effectively if you have understood exactly what the writer is trying to say and if you can see how the argument is constructed. In these activities, you will develop your ability to identify an argument and to analyse how it is constructed. You will then be in a much better position to judge whether you think the argument is a good one or not. 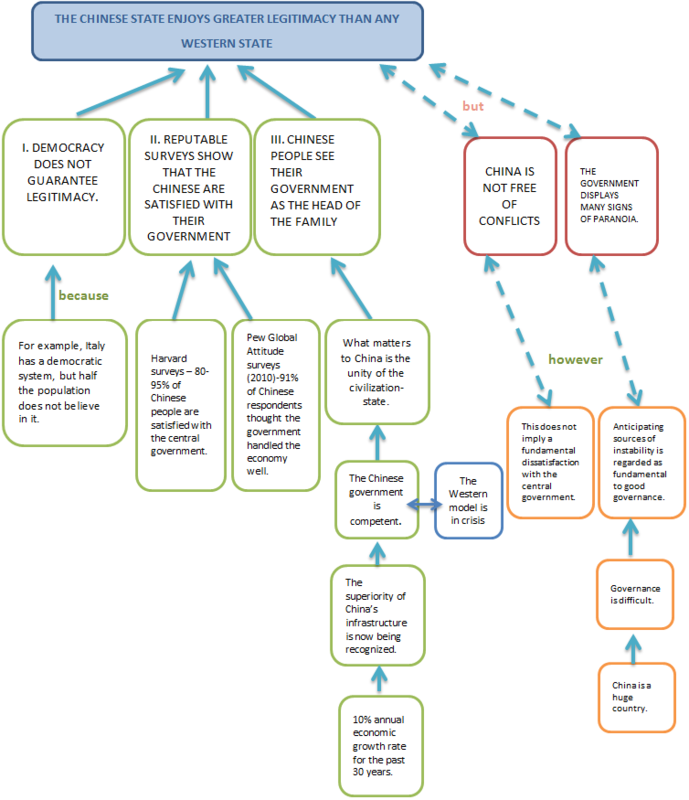 One technique often encouraged by experts of critical thinking is to build a visual representation of the argument – an argument map. Practising this technique will force you to read more critically and by the end of these tasks, you should be able to draw your own maps of arguments that are not too complex. The argument that follows is not particularly difficult, but you may find some of the vocabulary quite advanced. You should be able to work out what many of the words in the article mean from the context, but there are other words that you may need help with before you start reading. First, take a look at Task One below. All of the words below are taken from the article, Is China more legitimate than the West? Match the new words with their meanings by dragging the correct meaning on the right to the new vocabulary on the left. Use a dictionary to help you if you need to and don’t forget to read any example sentences your dictionary gives. You will find these words in blue in the reading. Words in green in the article are words that you may not understand when you first see them, but if you look carefully at the vocabulary nearby as well as the previous and following sentences, you should be able to work out what the word means. You may also be able to understand the word, because it is simply a different form of a word you already know such as legitimacy, ubiquitous or governance. Understanding part of a word (e.g. downfall) may help you to work out its meaning. Remember, you don’t always need to understand the exact meaning of the word to be able to understand what the writer is saying. Take a look at the argument map you have completed. Now that you can see and understand Martin Jacques’s argument very clearly, do you think his three claims are well supported? What do you think his argument should include to make his claims stronger? And what about the counterarguments? Are they attacked or refuted in a way that convinces you? Can you think of any counterarguments he does not include? Is all the evidence given explained sufficiently? By asking yourself these questions and thinking about possible answers to them you are starting to judge for yourself how strong the writer’s argument is and whether or not he provides enough evidence for you to believe him. This is the next step in critical thinking.